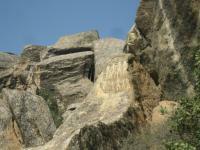 Gobustan Rock Art Cultural Landscape has an outstanding collection of more then 6,000 rock paintings. They depict primitive men, animals, battle-pieces, ritual dances, bullfights, boats with armed oarsmen, warriors with lances in their hands, camel caravans, pictures of sun and stars, on the average dating back to 5,000-20,000 years. What would an international trip be without a visit to a fine example of rock art? 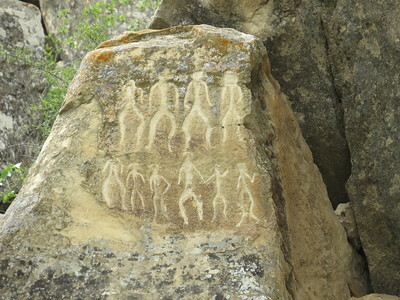 Azerbaijan is represented among the at least 60 rock art-related WHS with the Gobustan Rock Art Cultural Landscape. Gobustan is the name of a region near the Caspian Sea, where in the 1930’s the first discovery was made by local miners looking for gravel. The petroglyphs were carved into blocks of stone that had fallen from the cliffs above, blocks that provided natural shelter for those living in the area. The site now lies a couple of kilometres inland, but when the rock art was made the water level was much higher and these rocks were near the sea shore. It’s a quite barren area nowadays, from which you can see the offshore oilfields that keep Azerbaijan’s economics afloat. Next to the entrance of the sizeable archaeological area lies the modern Gobustan Museum. Other reviewers already have sung praise about this museum which is a 2011 addition to the ‘visitor experience’. I can only second that: it has a comprehensive exhibition that relies heavily on audio-visuals and computer animations. Our enthousiastic Azeri guide loved showing the developmental history of the site by swiping forwards and backwards in time. The WHS officially comprises 3 areas with rock art, surrounding 3 table mountains that can be seen from the entrance. We only went to see one of these, Boyukdash. It seems that all tourists are immediately directed there, I even doubt that the other two locations are visitable by non-scientists. There’s a short trail here that leads along some 20 rocks with engravings. The rocks are all numbered (another relic from Soviet times), but no explanation is given where to look and what to look for. We visited in the early afternoon, and the petroglyphs were easy to see. The stone is quite soft, and most of the time the chiselling technique that leads to broader and deeper carvings seems to have been used. One of the highlights lies immediately at the start of the trail: ‘the dancing people’. A fragment of this is also displayed on the Azeri 5 Manat banknote (in the top left corner, you have to look closely). It is tempting to compare this site to the Coa Valley Rock Art WHS, which I visited just a few weeks ago in Portugal. Both are petroglyphs (i.e. : not paintings or drawings), and date from about the same period: the Upper Palaeolithic. There are various ideas about the exact age of Gobustan, but the displays in the museum start at about 15.000 BC. This was seconded by our guide, who had been a deputy director of the Gobustan archaeological site in the 1990s (in his lifetime he also had grown up on a kolchoz and served in the Soviet army, and now makes a decent living in tourism). The visiting experience between the two sites however is completely different: due to the secluded location of the Coa Valley the visit there felt more exclusive, and the carvings were explained in more detail by the specialized guide. Here in Azerbaijan only a short overview for general tourists is provided (there were also many schoolchildren around). Gobustan’s engravings span a longer period though, so it has greater variety in depicted objects than Coa. Best known among these are the boat petroglyphs, made famous by Thor Heyerdahl). During the bus ride back to Baku with my tour group I was asked to explain a bit about World Heritage and why Gobustan has become a WHS. It is a rocky story, where Azerbaijan proposed inclusion on 3 criteria but only one was awarded (hesitantly). The claims for 'place of worship' and 'interchange of ideas' weren’t substantiated enough. The UNESCO website now shows a meagre explanation of Gobustan’s OUV, calling it “a testimony to a way of life that has disappeared”. Despite most of the people that took a tour to the site, I did it the local way by public bus from Baku. It's really recommended to go to the museum first to have a better understanding of the site archaeological findings and visualize what it was in the past. It's a bit of walking uphill if you don't have a transportation, but the view along the way is rewarding. Especially you can see the village and the Caspian Sea on a sunny day. There are a lot of carvings along the path, some of them occurring a big area while some you might just missed if you don't look clearly. They are all sided by numbers so you can basically follow so you won't miss it. The carvings are in good condition with most of the symbols of human and animals. Some of the carvings are high up on the walls, sometimes wondering how they managed to get up at that level with limited tools available at that time. Some of the carvings are interesting too. Let your imagination flies and try to think in the Paleolithic mindset what the carvings are meant for. The rock art can be combined with the mud volcano trip which is not far away. These two are considered extraordinary visit sites in the region. Definitely worth the visit. widely spread over a huge area. Valcamonica and Tanum are more impressive, but the new museum is fantastic. An early start and a roadside breakfast together with some locals Azeri’s who’ve probably never met a Scandinavian traveler before, was the start of my visit to Gobustan. After some 2-3 hours drive, south of Baku the first stop was at the burping and oozing mud volcanoes. The volcanoes are found on a small hill not far from the Gobustan petroglyphs and are an absolute must if you can find your way on the bumpy roads without non-what-so-ever signs to direct you to the right place. A local guide is therefore an absolute must. On the road leading to the Gobustan visitor’s center and the rock carving site, there is another point of interest to be found – the “Roman graffiti”. A group of Roman soldiers, probably on a recognizance tour carved out a message stating the most Eastern point any Roman patrol ever ventured to. Over 6000 rock carvings have been found in Gobustan and bears witness of a 12000 year old civilization that once lived by the Caspian Sea shore. Today the sea is found some 7-8 km in the eastern direction but it is still a fascinating landscape with large rocks that once functioned as roofs to the early settlements. The carvings usually depict humans, domestic and wild animals, boats and battle scenes. Gobustan was 1 of 3 “Rock Art” sites among the 22 added in 2007 (with Twyfelfontein and Lopé). There are already many such sites on the list (see my reviews of Valcamonica, Tanum, Alta and the Matabo Hills for just some of them!). Whether Gobustan adds a great deal is open to some debate. In 2004 ICOMOS had decided that the nomination should be deferred to allow development of a research program. The revised 2007 evaluation concluded that the site met but 1 of the proposed criteria (but that a case had not been adequately made on 2 others) and recommended further referral for reasons of management plan and boundary “inadequacies” - yet UNESCO accepted the site on all 3 criteria! If you are in Baku you should certainly take the c65 kms trip south to see it but we personally, as non-experts, wouldn’t rate the visit that highly in comparison with the other rupestrian sites we have seen, either for what is on show or for the conditions under which you are shown it. One problem with visiting sights which are then inscribed some years later is that one hasn’t always taken a photo as confirmation of the visit! And, when we visited in August 2000, we certainly hadn’t regarded this site as future “World Heritage” material “requiring” such a snap (There was no easily available “T List” information then). But that isn’t the main reason why the only “confirmation photo” I can provide is of the ticket for visiting “Qobustan”. Perhaps reflecting the fact that one of our expensive (foreigners?) tickets is numbered “00002” (I have lost the other which may indeed have been “00001”) and that there were no other visitors that morning, we were treated to the full weight of officialdom on our arrival with lectures on all the things one couldn’t do and close supervision throughout (the 2003 evaluation talks of 1000-2000 visitors pa – though it doesn’t seem credible that this could include Azeris). Yet both the 2004 and 2007 evaluations (rightly) criticise such practices as filling the engravings with toothpaste to assist photography – who was doing it and how! I feel that we, as foreigners, were receiving “special treatment”! I cannot remember whether the reason I took no photos was because we were told that it was forbidden or because it required some outrageous “foreigners” price ticket. Oh for the relaxed and friendly Scandinavian approach towards visitors at Tanum and Alta! We only visited the main area described in the inscription documentation as “Boyukdash” situated on a cliff overlooking the Caspian with oil derricks as and connecting bridges as far as the eye could see. But, having seen the photos of the Gobustan inscriptions on the Web, I don’t believe that our officious guide took us to see a full range of the Palaeolithic and Bronze Age inscriptions. Indeed, my main memory of the visit was of the “singing stones” rather than of the rock art itself, recollection of which has largely been erased by the passage if time. These stones permit a range of musical notes to be “played” on them and were certainly used for this purpose in prehistoric times. The site has a little museum which I also remember more than the in-situ drawings. Those interested in “travel trivia” might be interested to know of a fenced-in rock near to Gobustan (you can pass it on the way to/from from the main road to Baku) with what is the eastern-most Roman inscription ever found (it commemorates the 12th Legion which reached there in around 75AD during the reign of Emperor Domitian) – it is NOT part of the inscribed site (but I DO have a photo of it!). On Banknotes: Petroglyphs from Gobustan are depicted on the reverse of the Azerbaijani 5 manat banknote issued since 2006. 75 Community Members have visited.